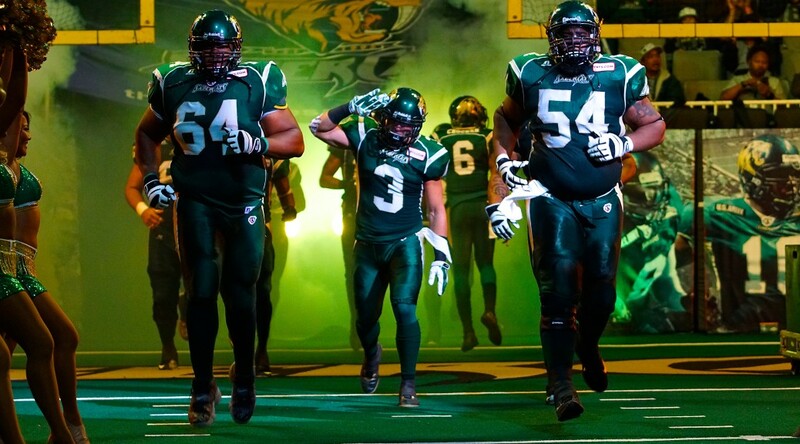 SAN JOSE, Calif.– The San Jose SaberCats (11-0) remain unbeaten, as they defeated visiting Pacific Division foe, the Spokane Shock (3-7), 55-26 on Friday night. 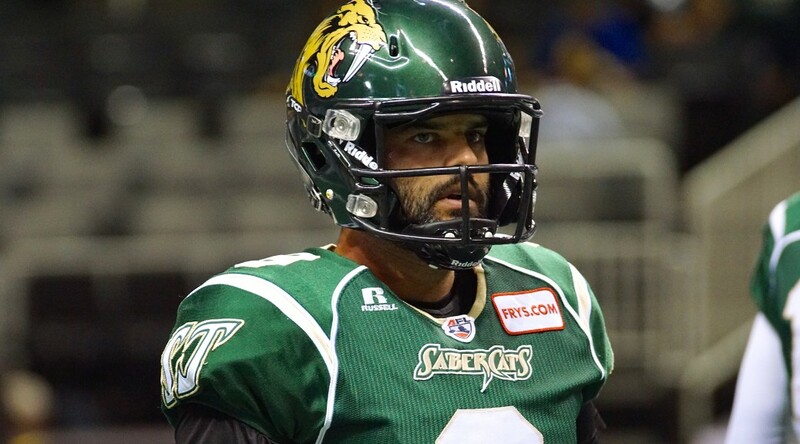 The SaberCats got off to a quick start, taking two plays to score with quarterback Erik Meyer running into the end zone for a 6-yard touchdown to give San Jose an early 7-0 lead. Meyer completed 27-of-39 passes for 260 yards and five touchdowns, while adding two more scores on the ground. 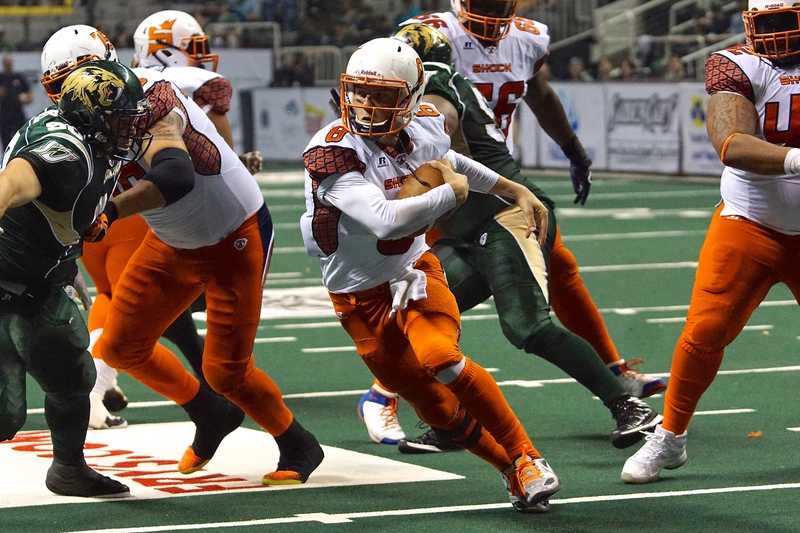 With great field position set up by a 39-yard kickoff return from Anthony Amos, the Shock capped its opening drive off with a quarterback run of its own, as Warren Smith snuck in for the 1-yard touchdown. Meyer completed 27-of-39 passes for 260 yards and five touchdowns, while adding two more scores on the ground. 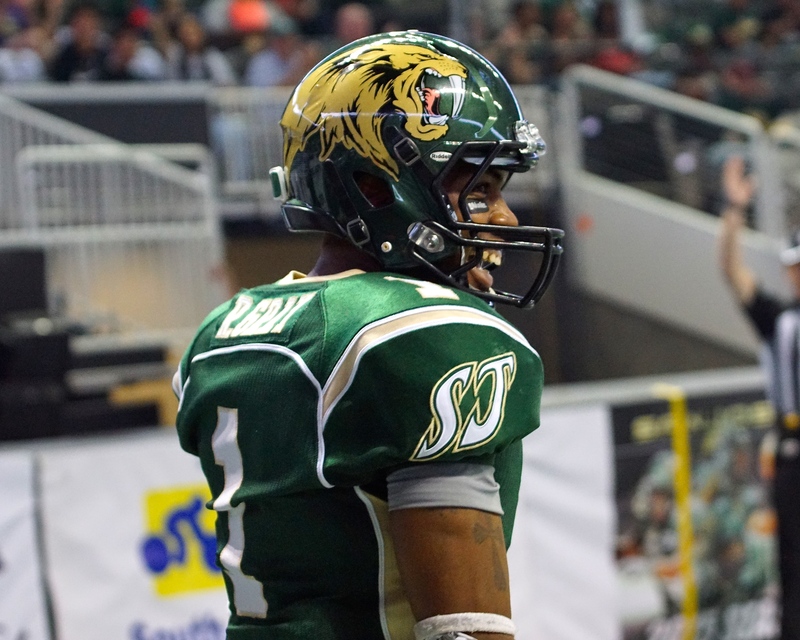 Striking again, San Jose answered with a 13-yard pass from Meyer to Gray, as the SaberCats held a 14-6 edge in the first quarter. 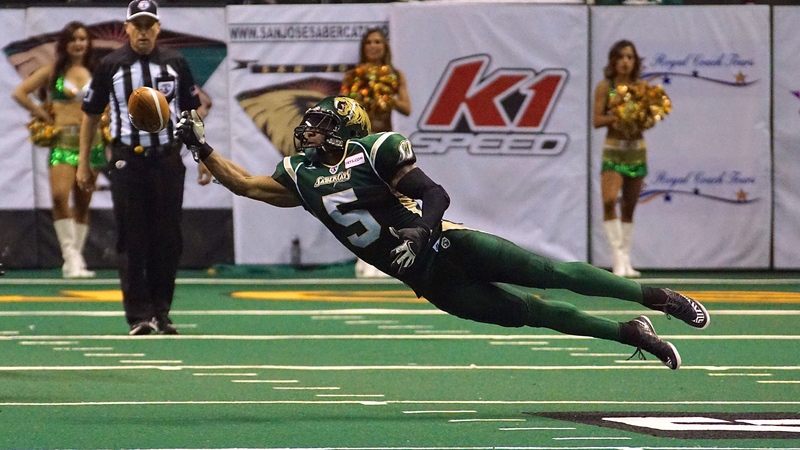 Gray, the AFL Week 9 Most Valuable Player, finished with 10 receptions for 122 yards and two touchdowns to lead the SaberCats. 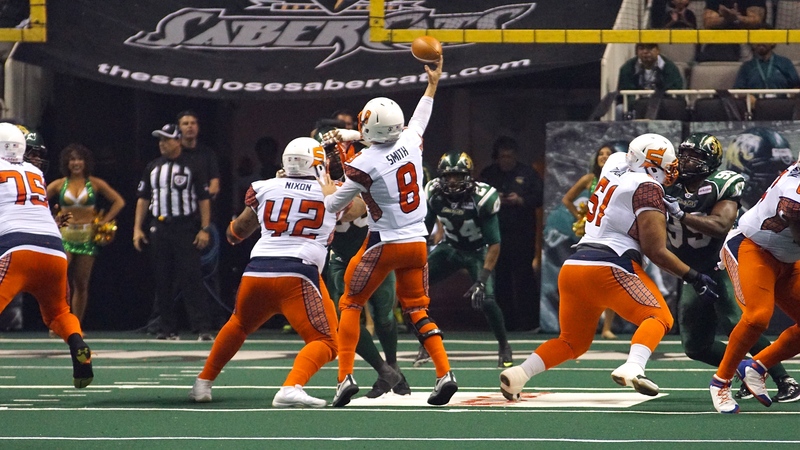 Late in the first half, Jeremy Kelley hauled in a 7-yard touchdown reception from Meyer, the first of his AFL career, giving San Jose a 28-13 advantage. Kelley added a 4-yard touchdown in the fourth quarter, finishing with three receptions for 17 yards and two touchdowns. 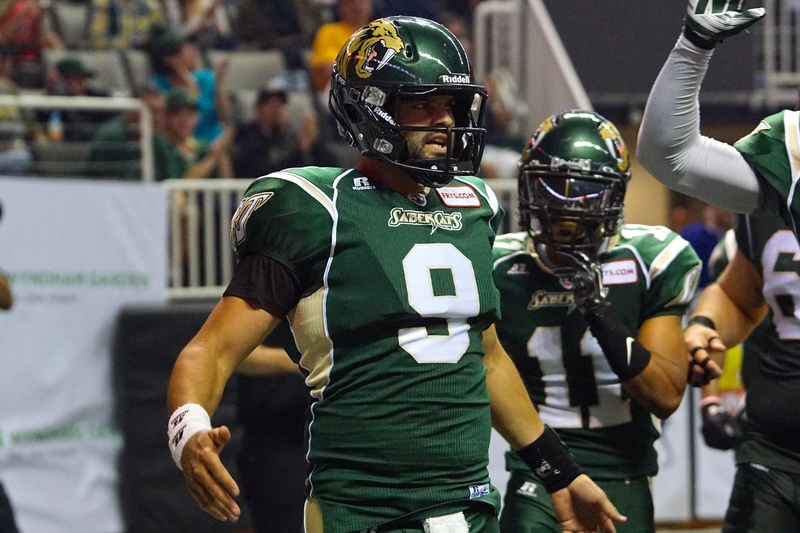 Driving down to the seven yard line, Spokane had an opportunity to score on the last play of the first half, but Ken Fontenette broke up a pass from Smith and the 28-13 mark would stand at halftime. 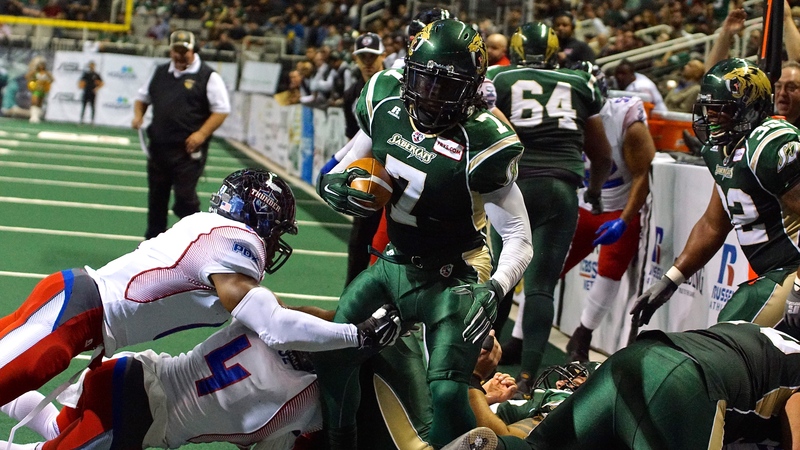 Fontenette, the AFL Week 10 MVP, led all defenders with 15 tackles and is currently leading the AFL in total tackles. 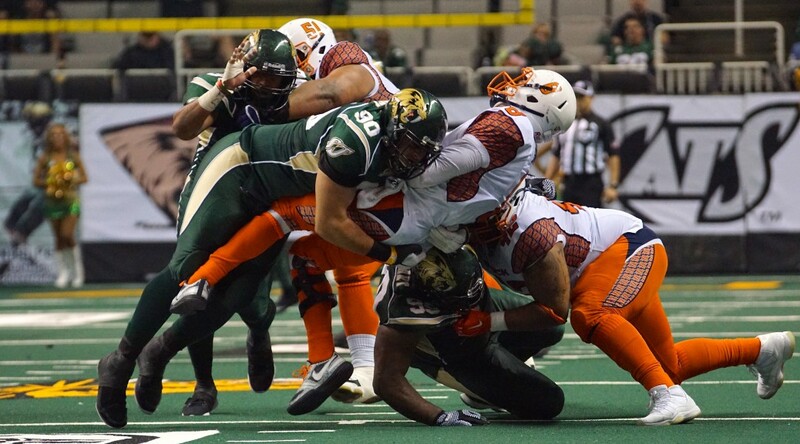 Spokane was without its leading pass rusher, James Ruffin, on its defensive front; however, it was the secondary for the Shock that was able to play great coverage on the SaberCats’ receivers. 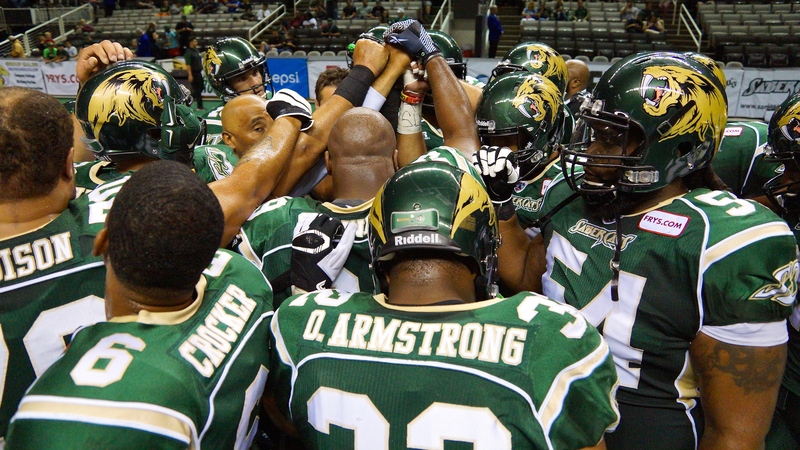 Still, the resilient SaberCats leaned on their ferocious defense to hold an advantage throughout the game. Relying on its depth, San Jose at one point even used receiver Darius Reynolds at the linebacker spot for a brief stint. 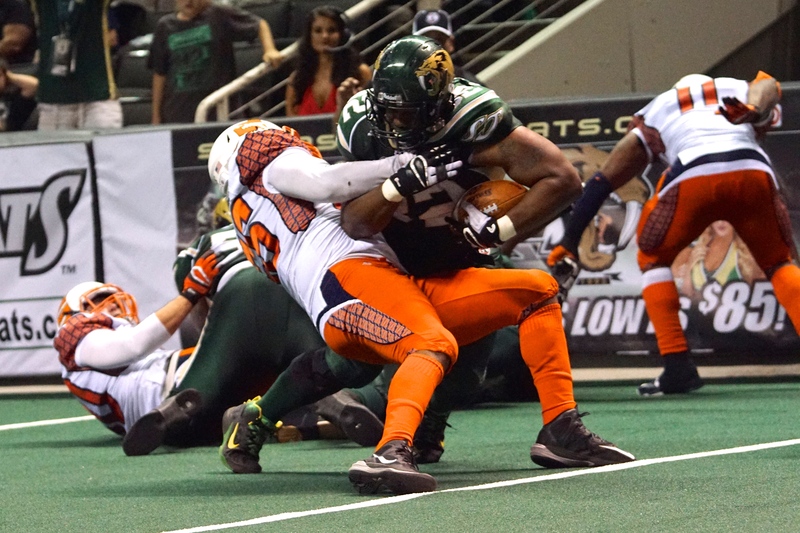 Leading the way for the Shock was receiver Anthony Amos, who hauled in a 24-yard touchdown pass from Smith in the second quarter, finishing with a team-high 11 receptions for 121 yards and the score. 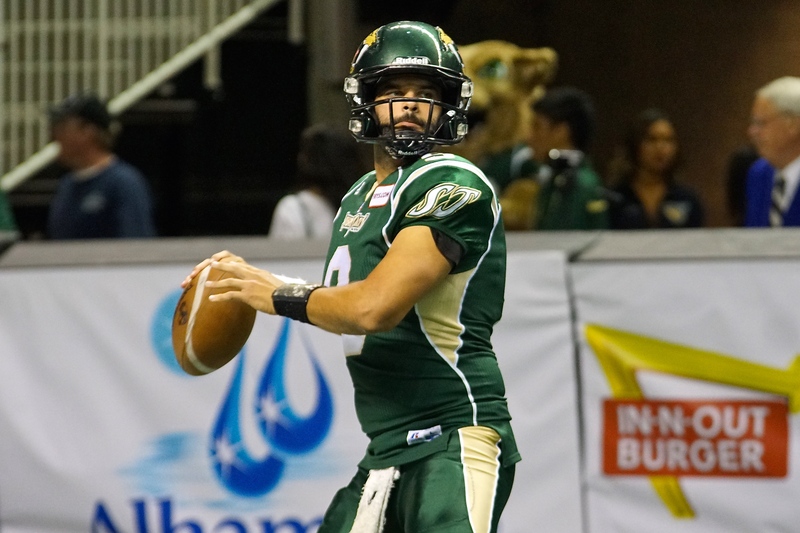 In his second start against the SaberCats’ top-ranked defense, Smith completed 23-of-41 passes for 231 yards and three touchdowns through the air (one on the ground). 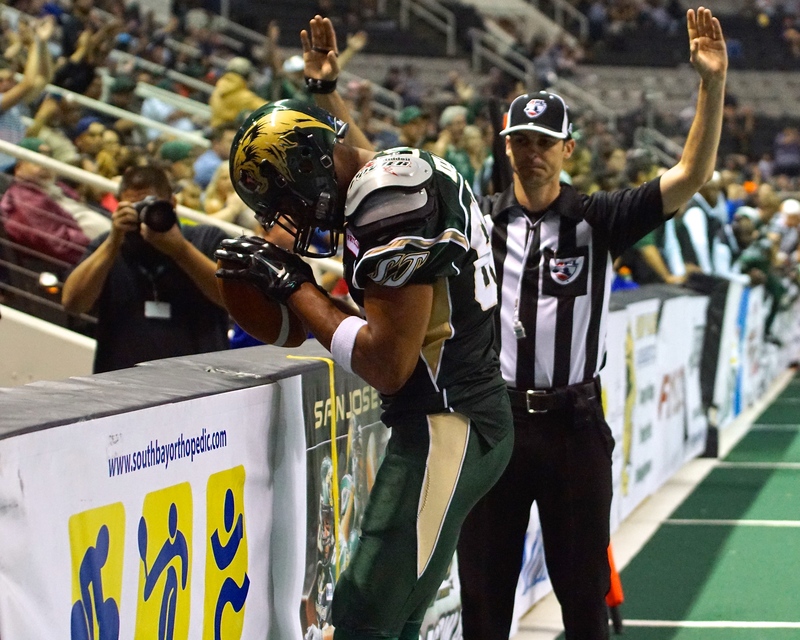 Falling over the boards in the corner of the end zone, Spokane receiver Nick Truesdell used his entire six-foot-seven-inch frame to haul in a 4-yard touchdown reception, as Spokane minimized the San Jose lead to 35-20 with 13:41 remaining in the fourth quarter. 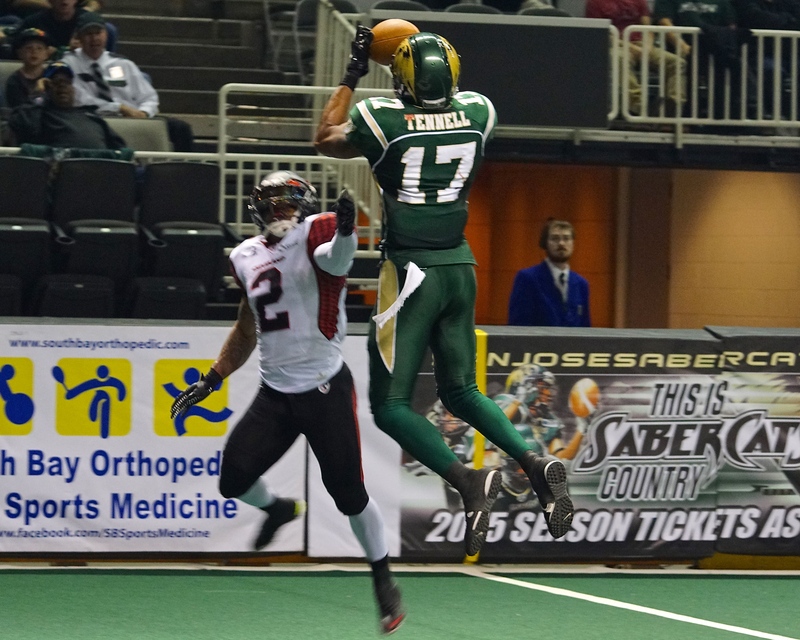 Coming off a four touchdown performance against the Arizona Rattlers last week, Truesdell was limited against San Jose’s prolific secondary, grabbing just five receptions for 32 yards and one touchdown. 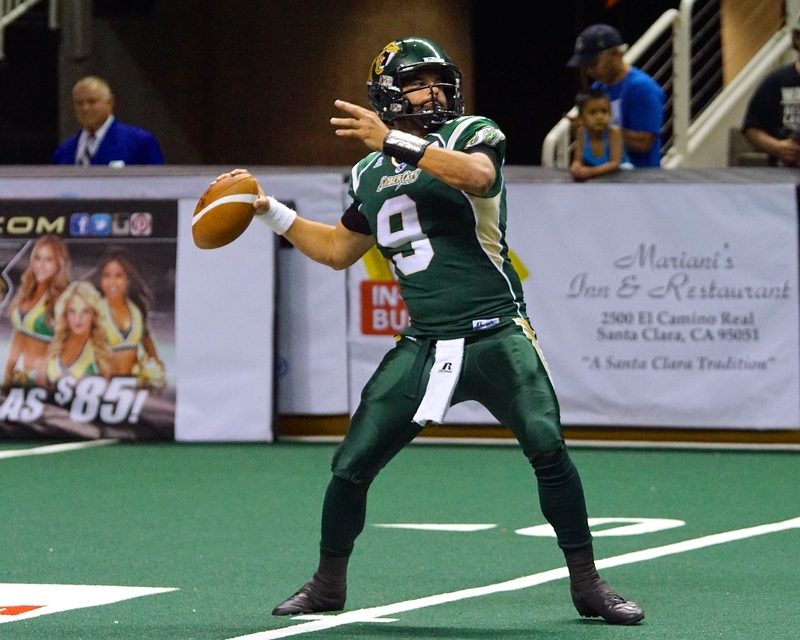 The SaberCats answered, with an 18-yard pass from Meyer to Gray, setting up Odie Armstrong for a 2-yard touchdown run, as San Jose pulled ahead 42-20. 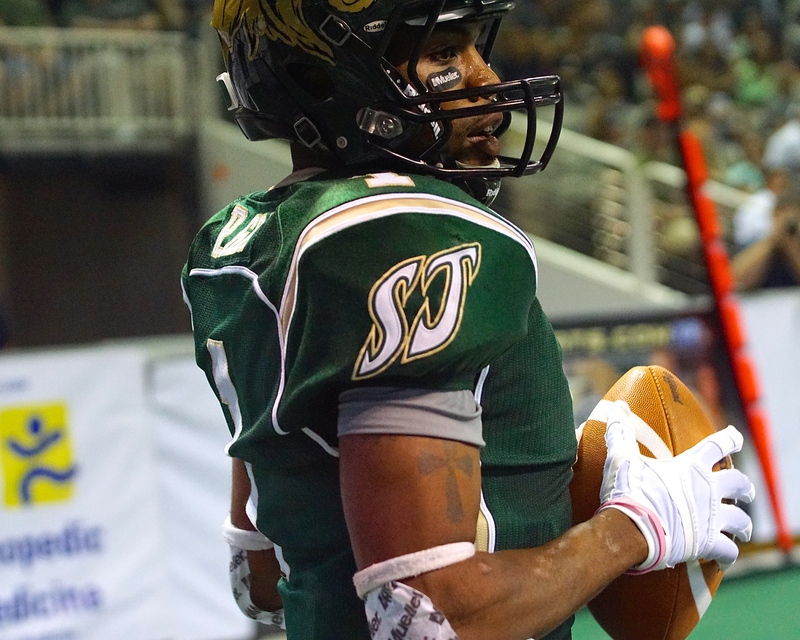 After trading touchdowns, the Shock held possession, trailing 49-26 with four minutes remaining, but the drive was halted when Mike Williams intercepted a Smith pass in the end zone, ultimately sealing the victory for the SaberCats. 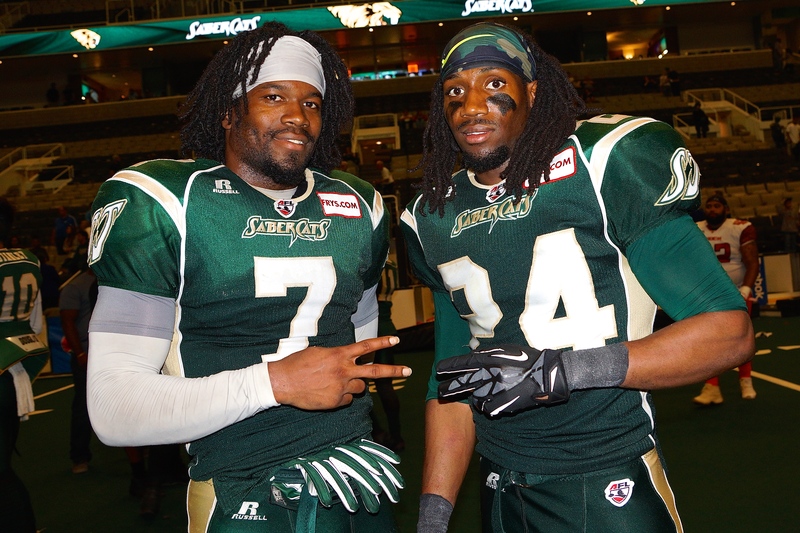 “Mike Williams started in the box, then at defensive back and at the end, he got an interception to close the game out,” said Arbet. 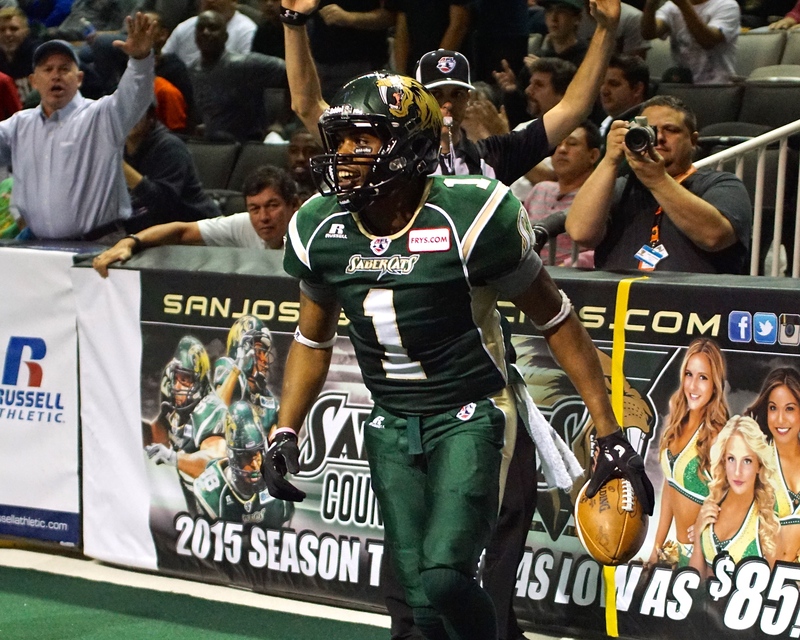 For San Jose, its next game will be at home in the SAP Center, against the Los Angeles Kiss on Saturday, June 13th at 7:30PM PDT. Highlight of the Game: FB Odie Armstrong catch and hurdle defender.